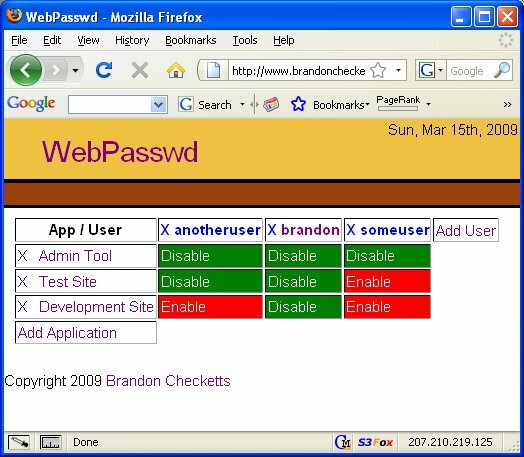 WebPasswd is a web-based frontend for managing passwords in a MySQL database. The intent is for it to be used with multiple users who require access to multiple applications protected by mod_auth_sql. It provides a single, central location for the password database instead of having separate htpasswd files scattered throughout servers. It provides a simple way to add and remove users, grant and revoke access to each application, and (currently with external scripting), for users to be able to change their own password. WebPasswd is written in pretty simple PHP. It requires a MySQL database (obviously) for storing the passwords. The servers that run your web applications will need to have mod_auth_mysql installed, which is readily available from most modern Linux distributions. Your web server needs to have access to the MySQL server if they are on different machines. Download WebPasswd R3 Here. Installation instructions are located in the INSTALL file. WebPasswd is released according to the GNU Public License v3. The program is release as-is with no kind of support at all. You can post comments here and I’ll try to answer them. If you have something wrong, the first step is to look at the Apache error log for any errors. If you have any questions, I’d encourage you to read through the code. It is pretty straightforward and you might even learn something. I wrote this to be functional for what I need, and it meets those needs right now. I can picture other things that might be useful for other users, but I have no reason to spend the time and energy on them if nobody is going to use it. If there is some feature that you would like to be added, please let me know and I will try to work on it. Of course, you are free to add it yourself as well.